The Drager QuadGard is a standalone, self contained control system for the detection of Toxic, Oxygen and Ex hazards. The system can be configured for up to four independent gas detectors. 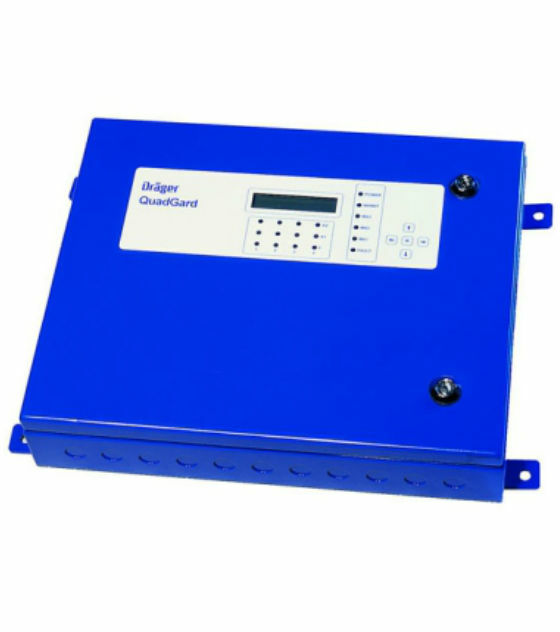 The QuadGard control system is suitable for one to four gas detectors; either two or three wire transmitters, toxic or Ex, mA or mV. There are three alarms per gas detector, and these alarms can be individual, common, or voted; rising, falling and/or latching. With its easy-to-use, password-protected menu structure, the system can be adapted to any customer-specific requirements. The settings for the connected transmitters and gases are entered via the integrated keypad. The gas concentration can be read from the 2-line LCD display. All of the status information is clearly arranged. LEDs in different colours give a quick overview over the current status of the equipment (e.g. power supply on, alarm raised, fault detected). With its robust, wall-mounted enclosure, the QuadGard conforms to protection class IP65 and is therefore also suitable for outdoor use.